CJP Saqib Nisar says laws should be made to provide security to those who genuinely need it. 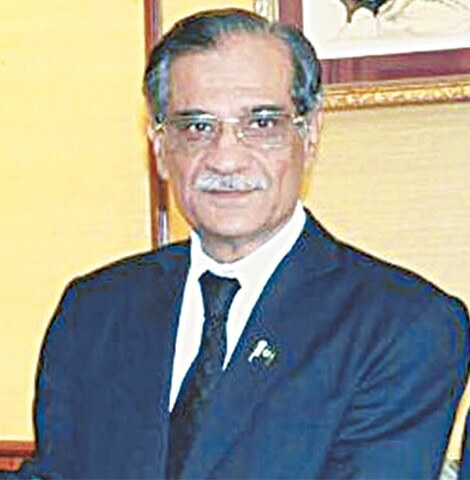 ISLAMABAD: As the Supreme Court is seized with a number of contempt of court cases, Chief Justice of Pakistan Mian Saqib Nisar on Monday hinted at interpreting Article 204 of the Constitution in a way to enhance the sentence until the convict purges his contempt before the court. “We are considering interpreting Article 204 of the Constitution independent of the provisions of the contempt of court ordinance (COCO) 2003 in a manner that punishment of six months may continue until the accused purges himself before the court,” the chief justice observed. The observation came during the hearing of a set of appeals by seven former senior members of the Islamabad capital administration and police personnel convicted of roughing up former chief justice Iftikhar Muhammad Chaudhry on March 13, 2007. The apex court initiates contempt of court proceedings under Article 204 of the Constitution read with COCO, 2003. While Article 204 empowers the court to initiate a contempt charge against individuals for scandalising the courts, Section 5 of COCO provides a punishment of six months or a fine extending up to Rs100,000. Under the 2003 contempt law, an appeal is heard by a five-member or larger bench. The appeals were moved against the Nov 1, 2007 order of the Supreme Court that had sentenced Islamabad’s senior administration officials and police personnel for manhandling Justice Chaudhry by preventing him from marching towards the apex court to answer the allegation of misuse of office before the Supreme Judicial Council (SJC). However, soon after the announcement, the sentence was suspended for 15 days on the request of the convicts for filing appeals against the convictions. Former Islamabad chief commissioner Khalid Pervaiz and deputy commissioner Chaudhry Mohammad Ali were sentenced to imprisonment till rising of the court, while former inspector general of police Chaudhry Iftikhar Ahmed and senior superintendent of police retired captain Zafar Iqbal were sentenced to 15 days in jail. 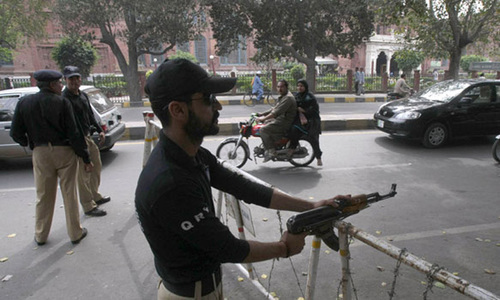 Deputy superintendent of police Jamil Hashmi, police inspector Rukhsar Mehdi and assistant sub-inspector Mohammad Siraj were sentenced to one month imprisonment. Later, a 10-member bench barred the respective departments from taking any adverse action against the appellants till pendency of their appeals. On Monday, the chief justice suggested senior counsel Sheikh Ehsanud Din to ask the former chief justice whether he was willing to pardon the contemnors. Subsequently, the counsel contacted the former chief justice and later told the court that Justice Chaudhry had communicated to him that he had nothing to do with the issue but it concerned with the prestige of the institution. 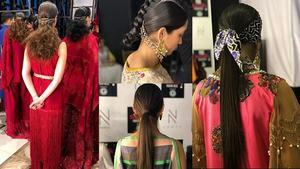 At this, the CJP observed that the Supreme Court would then proceed in accordance with law and referred the matter to a five-judge bench, as the appeals in contempt cases are always heard by larger benches. While resuming hearing of suo motu notice of availability of police security to non-entitled individuals, the Supreme Court observed that certain laws or rules be developed to provide police security only to those individuals who were at high risk and genuinely needed such security. The court, however, observed that a policy so made should not be subjective but objective. 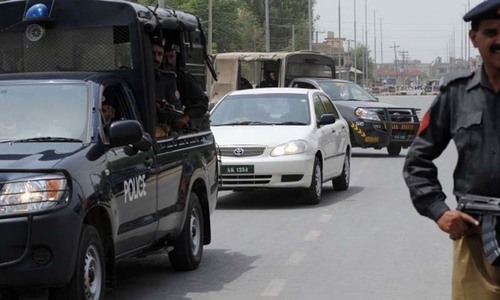 As a result of the notice, more than 12,600 police personnel deputed on security duties were withdrawn by the federal and the provincial governments from the individuals who were not entitled to keep them. In the exercise, police guards provided to former prime minister Nawaz Sharif, Awami National Party chief Asfandyar Wali and many others were withdrawn. On Monday, the chief justice said Mr Wali complained about the withdrawal of police security, observing that the same should be provided to him if it was necessary. He explained that the apex court never stopped the authorities from providing “permissible security” to ex-PM Nawaz Sharif. Security should be provided to individuals whether a politician, a lawyer or a media person if they were facing life threats, he added. The CJP recalled that a senior lawyer pleading a high-profile case had approached the court seeking protection and in turn the court entitled him for the provision of police security. Appearing before the apex court, Islamabad IGP Dr Sultan Azam Temuri said the police department had constituted a threat assessment committee comprising officials including those from intelligence agencies. The committee was tasked with examining requests for police security and deciding the cases, he added. CJP Nisar observed that the “real purpose” of taking the suo motu notice was to ensure that the taxpayers’ money is not wasted in providing police security to non-entitled individuals. The court then asked the top officials of police to submit a comprehensive report on the issue within a week. The Constitution does not allow him the authority to make laws. Well if the politicians are inept and corrupt, someone has to step up to protect the institutions and the rights of the public. CJP is well within his authority to take necessary precautions. As for ruling party, they have problem with everybody for they know they are in the wrong. Had the government done its job, no one would have take this initiative. Its never too late to strengthen our laws. Good move CJP. Why security to the rulers/persons who are themselves billionaires? Public offices including that of Police, Army, Administrative, Ministers, CMs and PMs comes with a known level of possible dangers and consequences. Only those people should accept such responsibilities who can dare to face such dangers and consequences. Thanks CJP sahib. It's a great decision taken at enhancing contempt of law punishment. Please also take notice of Tayyaba child-maid case regarding the suspension of judge's wife from punishment. She and her judge-husband both deserve an exemplary punishment. Just one year in prison for torturing and burning a little child-maid over many years, is a very lenient punishment. Justice should be equal for all. It is the misuse of law that CJP is trying to correct. @El Cid My sympathies are with you. @El Cid CJP is not making a law, but giving direction to conduct analysis of provision of security on case to case basis as per existing law unlike in the past, wherein security was provided to all & sundry while the common people were left high & dry. There are a number of contempt cases pending that needs to be finalized quickly so that culprits are punished according to law. Why delaying the verdicts, as public want to conclude these pending cases either way, otherwise, cronies of NS will continue insulting our honourable judges openly. Don't let them get away! @El Cid never appreciate the people who does something positive. The rule of law HAS to be imposed in Pakistan, particularly among this Sicilian Mafia and their cronies who threaten, malign and manipulate the people with their crafty speeches of injustice followed by terrorist attacks on Judges. Contempt of court, is the offense of being disobedient to or discourteous towards a court of law and its officers in the form of behavior that opposes or defies the authority, justice and dignity of the court or the towards a Judgement of the Court, which is considered illegal because the rules of a law court are not respected. The primary requirement of a progressive and cultured civil society is to respect its institutions, particularly the Supreme Court. The PML(N) has a long and dark history with the SC. Lets not forget that its workers physically entered and attacked the Supreme Court building in 2014. This must NEVER be allowed to happen EVER AGAIN! The contempt law is against the basic rights and must be annulled. @El Cid : I agree with you on that part. However, inaction by some encourages others to take responsibility. It is the job of the parliament to enact laws and it is the job of the judiciary to interpret and implement laws. However, if a law or an executive order is not for the benefit of the society as a whole then it can be challenged in courts and courts can render the law/executive order inadmissible or send it back to the Parliament/Executive for modification and further debate. Security is provided to all close & friends to the rulers, there should be some standards & approved SOPs.. It shroud not be " As per the dictates of the rulers & LEA's bosses" . @El Cid Agree..but there should be some rules & SOP's on it and don't leave it on likes & dislikes of the rulers or bosses !